When the Cross House was built in 1894 it had wall-to-wall carpeting on the first two floors, a great luxury. In such instances, plain pine floors would be laid under, as was done at the Cross House. However, for a very long time the house has had oak flooring. I always assumed this was installed in 1929 when the house was converted into apartments, and a whole lot of kitchens and bathrooms were created in the house. A few weeks ago the oak flooring in the library was torn out because it was too damaged to retain. What could be saved has been stored (to repair all the other floors in the house). In storing the good boards, I noticed that many had stickers on them; see above. Now, if there is one thing I know it is graphic design. And that BRUCE label is so not 1920s. It screams 1940s. 1) All the oak flooring is not 1920s, but rather late 1940s when the house was converted into a motel, and even more bathrooms were created in the house. 2) Or, maybe the second floors are 1920s, because the apartment conversion only affected the second floor. Then, when two more bathrooms were created in the library (on the first floor) for the motel conversion, new oak was laid down at this time. In short, maybe the second floor has 1920s oak, and the first floor 1940s oak? 3) Or maybe all the flooring is 1920s, save the library? Well, I now have a headache thinking about this. No doubt the house will reveal more answers over time. Well, just days after writing the above, the Cross House has, indeed, revealed more answers. Some of the flooring in the dining room had termite damage, so these boards were pulled up. 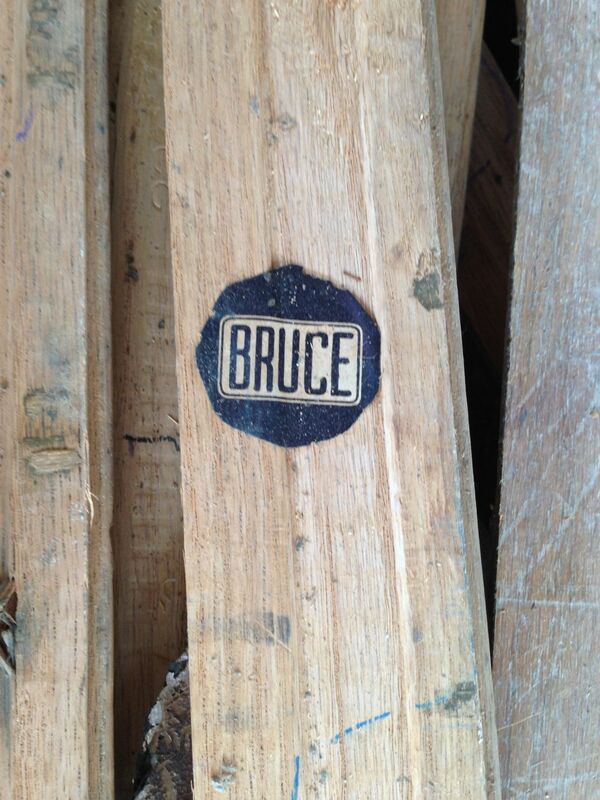 On the bottom of several boards was the BRUCE label. This would certainly mean that all of the first floor had oak laid down circa-1949, and not circa-1929 as I had always assumed. Later, we will be repairing the flooring on the second floor. Will the BRUCE label appear? Sometime between the 30s and the 50s, Bruce started etching their name into the wood, right on the bottom into the middle groove. I had some floor boards from them at my last place. No clue for sure when they started doing this, as the boards were put down (as an attic floor) sometime after the original build in 1924. Hi Alan, yes, all the boards have the BRUCE stamp. Some of the boards have the BRUCE label, too. And the label is clearly no earlier than 1940s. Were these plain pine planks the same width and thickness as the ones found in the rest of the house?